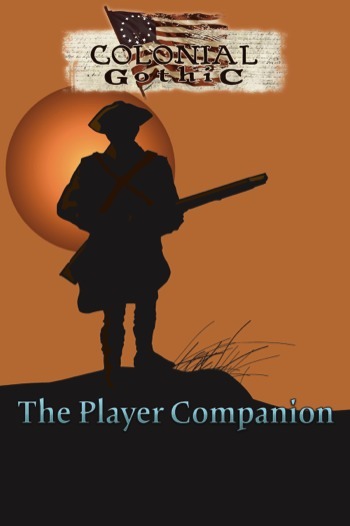 Yesterday was Halloween, and Rogue Games took advantage of the occasion to open preorders for Colonial Gothic: Player Companion. If you don’t know Colonial Gothic, it’s Rogue Games’ tabletop RPG of intrigue and supernatural horror at the dawn of American history. If you’re a fan of Sleepy Hollow – the TV series, the original story, or any of the movies – and you enjoy tabletop RPGs like Call of Cthulhu, you’ll find a lot to like about Colonial Gothic. I call it “the American Revolution as imagined by H. P. Lovecraft and Dan Brown,” but that’s just a starting point. It can be played like a tabletop version of Assassin’s Creed III, or as “Cthulhu 1776,” or even as “WFRP 1776.” We’ve heard from teachers who use it as a classroom tool, discarding all the supernatural elements to give students a first-person perspective on the birth of the nation. Rogue Games’ website offers more information about the game, and there are active fan communities on Facebook and Google+. As you’d expect, The Player Companion includes a lot of new player options, including skills, weapons, spells, and combat. There are also completely new systems for character advantages and disadvantages, social level (very important in those times), plus an updated version of the character templates from the old ebook release to make character (and NPC) creation quicker and easier. It comes in both print and PDF versons. Following on from the Bestiary, this book is part of an effort that has been close to my heart for a while: to build out from the 2nd Edition Rulebook and provide Colonial Gothic with a strong suite of core books that give players and GMs the ability to tailor the game to their own preferences. Richard and I are already talking about a GM’s book to complete the set. Richard is also working hard on the third installment of the Flames of Freedom campaign, to follow on from the critically acclaimed Boston Besieged and The Philadelphia Affair. As for me, I’m working on a super-secret project that will see me working with an old friend from my Warhammer Fantasy Roleplay days. All I can say about it for now is that it’s going to look amazing, and I expect it will cause quite a stir when I can finally talk about it. So if you like the idea of facing down scheming Freemasons, monsters from folklore, and Things Man Was Not Meant To Know as you uncover the secret history of the 18th century, give Colonial Gothic a try. We think you’ll like it. The Colonial Gothic Bestiary was released today. 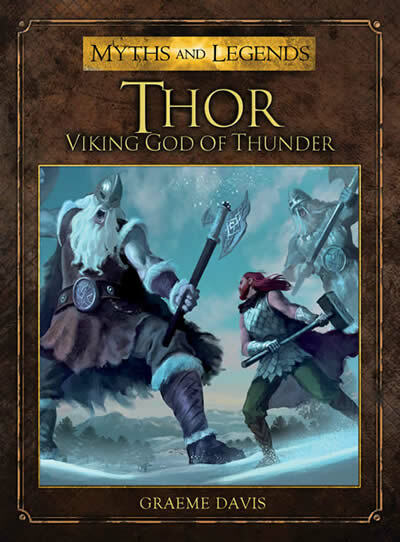 You can read the first review here – it’s a very welcome 5 stars from RPGnow.com. I’ve been pushing for this book ever since I first got involved with Colonial Gothic three years ago. This year, following the release of the second edition Rulebook, the time is finally right. Colonial Gothic’s range of adventures and sourcebooks has always been well received – almost none has averaged lower than a 4-star rating from the industry’s most influential review sites – and now we can release core books to support and grow the system itself. Richard and I decided that the first new core book should be a bestiary, and we plan to follow that up with a Players’ Guide and a GM’s Guide over the next couple of years. Watch this space. In addition, we will continue to support the acclaimed Flames of Freedom campaign and we will keep on producing ground-breaking adventures and supplements like Jennifer Brozek’s time-bending adventure The Lost Colony. To some, a bestiary may seem a strange choice for the first core supplement. Colonial Gothic is a horror game, after all, and the Rulebook includes a good selection of creatures for horror adventures. Even so, some important creatures were missing: local legends like the Jersey Devil, creatures from Native American tradition like the wampus cat, and local wildlife like the alligator. The book also includes summoned and enchanted creatures like the homunculus, two kinds of golem, and – of course – demons, devils, and undead aplenty. There are more than 50 creatures in all, but Colonial Gothic fans need not fear that we are turning the game into Colonial D&D. We’re not. Each creature has been chosen with a careful eye to how, why, and where it fits into the Thirteen Colonies and what it can bring to Colonial Gothic adventures. Each creature description includes notes on what it offers the GM, and more extensive notes are given for each creature class. Finally, there are two indices – one alphabetical and one by class – listing the creatures in the Rulebook as well as in the Bestiary, to make it easy for the GM to find exactly the right creature for a particular adventure or encounter. 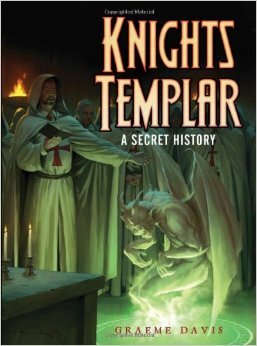 As I’ve said before, I have a long-standing love of historical fantasy and horror. I thought Colonial Gothic was a good idea the first time I heard of it, and it’s good to know that Richard and I are not alone. There are active groups on both Facebook and Google+ providing us with feedback and discussing everything from real-but-suspicious historical events to TV shows like Sleepy Hollow to the best miniatures and scenery for 18th-century games. You can also find Colonial Gothic news on Twitter (#ColonialGothic). I think 2014 is going to be a good year for Colonial Gothic. Richard and I have a number of ideas in the works. If you know Cotton Mather isn’t a personal hygiene product and Salem isn’t just a brand of cigarettes, if you ever wanted to save Joseph Curwen and the Whateleys of Dunwich from their own folly, if you want to know how Washington used Masonic secrets to win American independence – and what the Templars thought about his doing so – we think you will enjoy Colonial Gothic. You can find the Bestiary – and the rest of the Colonial Gothic range – on sale at the Rogue Games online store in PDF, ePub, Kindle, and dead-tree format. The various ebook versions are also available from your favorite download store. If you shop at, or run, a Friendly Local Game Store, please get in touch. Rogue Games is committed to supporting brick-and-mortar game retailers.